Tomoko Kawase (川瀬智子 born February 6, 1975) is a Japanese female singer and vocalist of musical group the brilliant green. As a solo artist, she has released music under the alter-ego pseudonyms Tommy february6 and Tommy heavenly6. Due to her marriage to Shunsaku Okuda, her legal name changed to Tomoko Okuda (奥田智子) however she is still credited under Kawase Tomoko. She is the lead vocalist and lyricist of the J-pop band the brilliant green. She was asked to join the band in 1995 after bassist Shunsaku Okuda and guitarist Ryo Matsui heard her sing in an amateur talent contest. 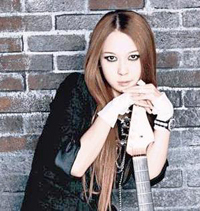 As the band's lyricist (as well as in her solo career) she sings and writes songs in both Japanese and English. Although she reportedly does not speak much English, she does have an English-speaking friend who sometimes runs a quick check through her lyrics, but his input is often minimal at best. Following the release of their 2002 album THE WINTER ALBUM, and the subsequent tour, the brilliant green disappeared, and during this time on November 22, 2003 Kawase announced her marriage to fellow band mate, bassist Shunsaku Okuda. On June 1, 2007, it was announced that after 5 years of inactivity, The Brilliant Green would be returning with a new single to celebrate their 10th anniversary. The song, titled "Stand by me," is the ending theme for the new series of TV drama, "Tantei Gakuen Q," which began on July 3rd 2007. The comeback began in earnest on August 22nd, 2007, as the band's new single hit the shops, and will continue with a new single, "Enemy" to be released on December 12th, 2007. The band is also providing the opening theme to the new anime Mobile Suit Gundam 00. The new song, "Ash Like Snow", has been released on February 6th. In 2001, Tomoko launched her solo career under the name of Tommy february6, a character named from a combination of her nickname and birthdate. Vastly different from the J-Rock sound of the brilliant green, Tommy february6's persona and sound are inspired by and derived from British and American 1980s synth-heavy pop. Her eponymous debut album was released on the day of her 27th birthday. Kawase's original intention with Tommy february6 was to create a character who was far from innocent, though cute in both sound and appearance; Tommy february6 was designed to be someone who was true to her feelings despite the cutesy nature of her outward character, do as she wanted (and as such, Tommy february6 is seen repeatedly in music videos drinking alcohol from flasks, bars, etc.) Unfortunately, the original concept started to disappoint her, and Kawase began to feel that the character could no longer maintain its purity. After a performance as Tommy february6 in 2003, Kawase took off her glasses and donned a much more alternative look to create Tommy heavenly6, a brand new character with a modern rock sound. Kawase would later explain that Tommy heavenly6 was born from a dream that Tommy february6 had, in which she extrovertly embraces all the elements of her personality she had previously been repressing. This is reflected in the promotional video for Tommy heavenly6's first single, Wait Till I Can Dream, wherein Tommy february6 drinks from a hip flask and falls asleep, only to be woken by Tommy heavenly6. Musically, she's the polar opposite of Tommy february6, and possesses an image most people would consider more dangerous, but Kawase claims that Tommy heavenly6 is far more pure and true to her heart than Tommy february6 is. Kawase claims that the invention of Tommy heavenly6 occurred due of her disappointment in Tommy february6's character, but far from being a replacement, Kawase chose to keep the two characters' careers separate. During 2003 and 2004, Tommy heavenly6 released only two singles, whilst Tommy february6 went on to release her second full album, Tommy airline. It would be in August 2005 (nearly exactly two years after her first single) that Tommy heavenly6 would finally release her third single, which was shortly followed by her own long awaited eponymous debut album. In 2006/2007 Kawase has had a very busy period, releasing five new singles and a new album, Heavy Starry Heavenly as Tommy heavenly6. She finished this productive phase with the Heavy Starry Tour, four live performances as Tommy heavenly6 during March 2007. She incorporated most of her songs into this live format, which lasted for an hour and a half , complete with her now regular backing band, and even her band mates from The Brilliant Green made guest appearances for some songs. On June 1 2007 The Brilliant Green announced they would be returning with a new material. Whether or not Tommy will continue with her solo projects in the future is unknown. In addition to her own solo singing career, Kawase has produced and written songs for the idol group Tommy☆angels, as well as making a protégé of current Hinoi Team member, Asuka Hinoi. Kawase has also made an appearance as the voice of Pikki in the anime series Piroppo, briefly modelled for Italian fashion house Fiorucci and for a period of time hosted Break Down, an MTV show. She also worked as a producer on the Takashi Fujii single, entitled OH MY JULIET.